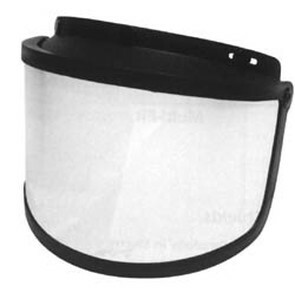 Fog Free Shield with Rigid Frame and Double Lens. Polycarbonate shield. Universal 3 metal snap fasteners and full ratchet-action flip movement. Black frame and sun visor. Double lens, seals dead air space between inner and outer lens, resists fog and freezing up. No anti-fog coating to peel or scratch off.